The CODUR workshop took place at the EMEMITALIA 2017 Conference in Bolzano (Italy) on August 31th. As part of the activities of the CODUR project, the main purpose of the workshop was to share with a wider audience the intellectual outputs elaborated so far within the project. In particular, the workshop aimed to promote debate and exchange about the evaluation of the online dimension within the University ranking systems. The workshop was organised in two phases, for a total duration of approximately 4 hours. In the morning, a Round Table was held where six invited experts gave their contributions on the topic with great interest for the participating audience. In the afternoon, a working session was organised as continuation of the morning session, where all the workshop participants (experts and audience from the morning session) could actively contribute and provide their opinions and feedback. The Round Table discussion centred upon university rankings and e-learning dimension. Prior to the event, the experts had been provided with the provisional list of the CODUR criteria and indicators and were asked to comment on them during their speech. Floriana Falcinelli, from the University of Perugia, is University Deputy for e-Learning. Patrizia Ghislandi, from the University of Trento, is Director of the University Lab for Educational Innovation. Pier Paolo Limone, from the University of Foggia, is University Deputy for e-Learning. 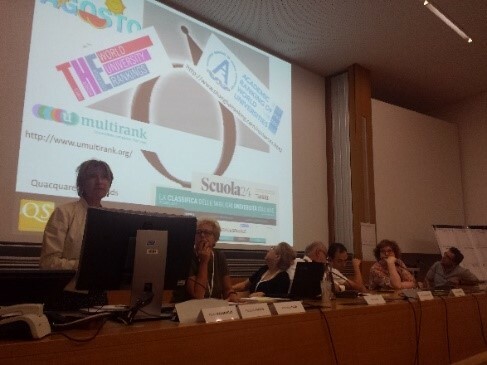 Tommaso Minerva, from the University of Modena and Reggio, is member of the University Committee for e-learning. Pier Giuseppe Rossi, from the University of Macerata, is University Deputy for e-Learning and Director of the University Centre for e-learning (CELFI). Marina Rui, from the University of Genova, is University Deputy for e-Learning. The Round Table was introduced by Francesca Pozzi (ITD-CNR) and chaired by Donatella Persico (CNR-ITD). The discussion turned out to be quite alive, thus demonstrating that the proposed topic is very hot within the Italian University context. Through the discussion among the six experts participating in the Round Table, some interesting themes emerged and a significant feedback related to the CODUR proposal was collected. During the second phase, all the workshop participants, including both the experts and the audience of the Round Table, were actively engaged in a decision-making collaborative group-based session, through which it was possible to collect further inputs and feedback concerning the CODUR criteria and indicators.